Amplifinity referral marketing software generates revenue growth for sales-driven companies. Amplifinity turns customer, partner and employee advocacy into high-quality leads by integrating referrals into marketing and sales processes. Companies like ADP and DIRECTV trust Amplifinity to enable high-quality acquisition while providing an engaging experience for their advocates. "One of the best management referral platforms out there"
For starters, it integrated seamlessly with SalesForce, which is a big win. However, it was a tremendous cost/benefit for our team because of its ease of use, and its straightforward dashboard. Furthermore, the ability to track all reward referrals in one place was a plus. Finally though, its simplicity and its reporting functions made it a win-win for our team. The SalesForce integration took some more time than we anticipated, and the reports were a bit more effort than we needed. Specifically, each contact referral in the system required me to physically click on the contact record in order to see how they were referred to us and which company they were with. It has very specific referral features that can be a tremendous help, but you should try a demo rather than commit to a full implementation of it. Also, I feel like this works best for smaller companies with lower scale referral campaigns and programs. The aspects to dislike about Amplifinity are minimal and easily forgiven because it enabled our team to track reward referrals in a way we had not previously been capable. This led to our sales team pitching this capability as part of the sales process, and ultimately led to higher rates of conversions. "Decent platform for kickstarting your referral process"
When we were looking for a managed referral platform about 6 months ago, Amplifinity quickly stood out as a great value, and they also promised eventual integration with Salesforce. Once the implementation was finished, they delivered on their promise to integrate with Salesforce, and now the entire process is automated. They've created a new object in Salesforce specifically for advocates that links back to the contact record, so it's easy to track who a customer has referred, and when. You can also automate invites from Salesforce itself, and the customer's experience of both signing up and referring names seems to be straightforward. The Amplifinity dashboard itself is fairly easy to navigate and has some reporting capabilities. The rewards program also makes it easy to incentivize referrals, and to track out the payments for leads as needed. The implementation process was too clunky and prolonged. While Salesforce integration did eventually happen, it took several months longer than we had expected. My role in marketing is primarily centered around customer advocacy anyway, so I was hoping that the referral invitation process and tracking method would be more seamless - that way I could start recruiting my advocates into this program from the start. However, the manual uploading process was tiresome and a bit too DIY for my tastes, and it caused a lot of delays. The initial demo platform also took forever for their developers to adjust when we needed something changed, and our creative and content teams had to have dozens of meetings with the onboarding specialists just to upload basic email templates or make changes to the referral pages. I also think that the dashboard needs a lot of simplification for the end-user, and their reporting capabilities could be boosted. Finally, I don't like that the reports in the Amplifinity platform itself make it difficult to see which contact a given prospect is attached to - you have to open the contact record itself to see their referrals. But this is a minor issue and more of a nitpick than anything. Make sure that you have clear goals in place with your sales team before considering Amplifinity. It's a fantastic tool for what it is, but unless you have a plan, it's probably not going to be much help, because it's relatively sparse feature-wise. You need to identify what your referral potential is, have effective content written up to support it, and have a sales team that will really deliver on referral goals, or it's just going to sit there. I also would recommend that you identify what your referral priorities are, because if you absolutely need a full-time managed and automated service, Amplifinity won't be right for you. From what I've seen, it works best for smaller, more hands-on referral programs like ours, where it really isn't the priority across our organization, but it does serve to add additional value. We've been able to track referrals more efficiently than before, and it's helping our sales team to generate solid new leads. This referral program provides a slightly lighter option than our other partnership agreements, so it's easy to generate leads quickly from the smaller customers. 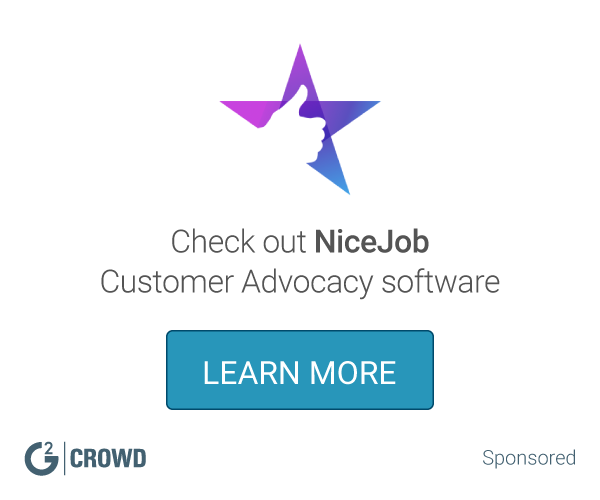 For my own purposes, it gives my advocates added value and satisfaction, especially if they're already recommending Jive to their friends and colleagues. While we don't really have experience with any other referral platforms, Amplifinity seems to fill the role quite adequately for our current needs. I don't know if I'd sing its praises from the mountaintop, but it's certainly better than nothing. Thank you for your feedback Claire, we will use it to improve our implementation process. We are dedicated to offering our customers the best experience at all times and we regret that the implementation process was longer than expected for Jive. We have made significant strides in recent months to streamline the implementation and onboarding process for our clients, and continue to refine our product to make it quicker and easier. We are also busy finalizing some new and improved reporting features that will greatly enhance the ease-of-use and available functionality for our clients. * We monitor all Amplifinity reviews to prevent fraudulent reviews and keep review quality high. We do not post reviews by company employees or direct competitors. Validated reviews require the user to submit a screenshot of the product containing their user ID, in order to verify a user is an actual user of the product. Hi there! Are you looking to implement a solution like Amplifinity?